Will Snapmaker make its products 3MF compatible? 3MF (https://3mf.io/) is an industry consortium working to define a 3D printing format that will allow design applications to send full-fidelity 3D models to a mix of other applications, platforms, services and printers. It would be good for Snapmaker to join this consortium or to make their products compatible with 3MF spec. That would allow Snapmaker products more accessible with a large ecosystem of software and services. Your feedback and advice will make Snapmaker better. After doing some research. Below is my observation. STL (STereoLithography) is one of the most important neutral 3D file formats in the domain of 3D printing, rapid prototyping, and computer aided manufacturing. The OBJ file format, by virtue of being neutral or open, is one of the most popular interchange formats for 3D graphics. It is also gaining traction in the 3D printing industry as the industry moves towards full color printing. I have read through 3mf specification. Comparing with STL, it has more interesting features, and has good characteristics. Leading company like Autodesk, Shapeways, 3DSystem, etc. are memebers of this consortium. Which means It has a great chance to become popular. It’s file format which was designed to compete, Human readable, Simple, Extensible, unambiguous, Free. 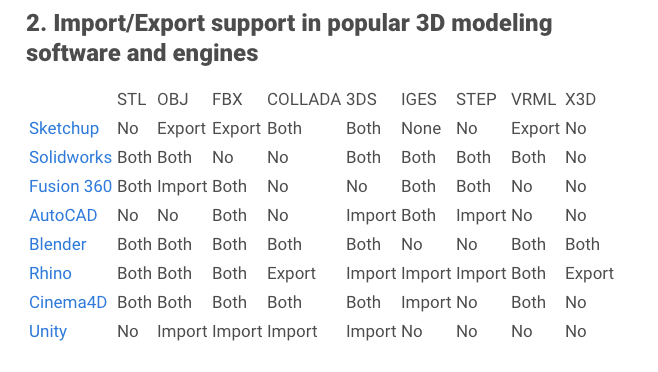 STL and OBJ will be the most widely used file format in 3D Printing for a long time, at least for entry level(consumer vs industrial) 3D Printer. Another story I want to share: In web standard movement, xhtml was considered as next generation of html4. But html5 win instead of xhmtl, although it has good characteristics. In a word, Risks exist to adopt new standard too early. We are working hard to become better company and eventually want to lead this innovation. But for now, We have limit resource, I think we can’t take that risk to embrace this spec in this early stage. Looking forward to hear you back. In my opinion this is not matter of choosing one file format vs another, it is about be part of an ecosystem. put Snapmaker 3-in-1 to compete in same footing as other 3D printers in the market. For example, anyone buying printers listed at https://developer.microsoft.com/en-us/windows/hardware/3d-print/printing-partners is already taking the benefits of using 3D Builder App or writing their own apps. * Full disclosure: I’m a Microsoft employee, but my use of Snapmaker products and services are not related to my job. My opinions in this message/forum are personal and are not associated in any way, shape or form with Microsoft. I do not work in the 3D Builder team. One problem with that: you’d leave out all the Mac users. If standards are going to be used, then they need to be applied equally to the major operating systems. Making Snapmaker products compatible with 3MF is about joining an ecosystem. It does not mean that customers running operational systems that didn’t join the consortium (yet) would be left on the dark. Actually it could bring even more customers to the table. Think about it, Apple has the resources to join the consortium and to jump at the 3D bandwagon at any time. Apple just need to want to. Alternatively, building a MacOS driver is a well documented task that would not be that different from writing a Windows driver. Moreover, given how much Google likes open standards, it might be possible that Google also join the consortium and bring Android customers to the table as well. Keeping a 3D software package development is expensive. Take for example Simplify3D. In order to stay in the business, they charge USD 149 per license. Another example, is Ultimaker (the creator of Cura). They can afford not charging for its software because their business model. By the way, Snapmaker3D takes a piggyback on some Cura components (like the slicer). Incorporating parts of Cura into Snapmaker3D was a good strategy that saved Snapmaker a considerable amount of money. Finally, Ultimaker is also member of the 3MF consortium. The bottom line is, building a driver for a 3D printer for Windows (https://docs.microsoft.com/en-us/windows-hardware/drivers/3dprint/index) would relief Snapmaker resources to focus in other innovations while expanding Snapmaker footprint.